The Rough Guide to The Bahamas is your definitive handbook to these beautiful islands. From the finest scuba and snorkelling spots on Paradise Island to the bustling cities of Nassau and Freeport, the full-colour section introduces all of the region's highlights. For every town and village, there are comprehensive and opinionated listings of all the best resorts, hotels, bars and restaurants, to suit all tastes and budgets, plus a new Author's Pick' feature to highlight the very best options. There is plenty of practical advice for a host of outdoor activities from hiking and fishing to surfing and kayaking. The guide also includes lively accounts of Bahamian history, culture and wildlife and comes complete with maps covering the entire region. Scattered like a handful of pirate's gold across 100,000 sq miles of turquoise ocean, the islands of the Bahamas could practically patent the word 'paradise'. Written by 2 expert authors, 64 days of research, 43 maps, 135 beaches combed; clear, easy-to-use maps; comprehensive planning tools; diving in the Bahamas feature. In the 1940s, when the Duke and Duchess of Windsor ruled The Bahamas (after he'd renounced the British throne), the islands were considered exclusive. Beginning in the 1960s, that reputation changed. Today the islands lure people from all walks of life, whether they want a $500-a-day luxury resort or prefer to rough it for $50-a-day on one of the little-visited Out Islands. If you've decided that The Bahamas sounds like the perfect place to relax, feel free to start unwinding right now, because we've done all the legwork for you. Here you'll find our carefully compiled lists of the best that The Bahamas has to offer, from beaches and dive sites to resorts, restaurants, and sightseeing -- and nearly everything else you'll want to see and do. This book provides detailed coverage of the best diving destinations in the Bahamas. The guide is crammed with fully updated information, from descriptions of individual dive sites to valuable advice on techniques and equipment. The guides also feature handy travel tips. Featuring gorgeous, full-colour underwater photography and useful area maps, this Dive guide is an indispensable companion for anyone planning a trip to one of the world's most exciting and challenging dive sites. Identification guide to the birds of popular tourist destinations, from Grand Bahama Island to Grenada. The Bahamas archipelago consists of almost 700 islands situated adjacent to the Gulf Stream and surrounded by the warm waters of the Atlantic Ocean. The sub-tropical to tropical climate provides an ideal growing environment for a huge variety of both common and exotic non-flowering and flowering types of trees. This is a valuable guide both for residents and visitors interested in identifying the trees found in The Bahamas. Illustrated with colour photographs and drawings this practical guide to the trees of the islands is both comprehensive and informative. A comprehensive ornithological guide introducing both visitors and residents to the bird life of the The Bahamas and the neighbouring Turks and Caicos Islands. The book contains colour photographs and information on the breeding birds of the region plus the most commonly recorded migrants that either pass through on their way to other destinations or stay during the winter season. The level of presentation is introductory and many detailed explanations and more technical terms have been avoided. Behaviour and habitat preferences are covered as well as calls and songs. Previously known as Hog Island, this tiny island has been developed over the years into a playground for millionaires and pleasure seekers. Now completely revised twenty years after the publication of the first edition, the story of Paradise Island has been brought completely up to date. Paul Albury's daughter and son-in-law, have revised the original text and added new chapters and colour photographs to illustrate the Paradise Island of the twenty first century. About the author: Dr. Paul Albury was Bahamian and was born on Harbour Island. He lived and worked in Nassau until his death in 1987 and was well-known throughout The Bahamas for his wide interest in Bahamian history. He was in great demand as a speaker on the subject and communicated his enthusiasm to his listeners. He also wrote the best selling history The Story of The Bahamas and a number of articles for journals and newspapers on aspects of Bahamian history. For many years he was a member, and former President of The Bahamas Historical Society. The Bahamas is one of the most touristic Caribbean island countries, with huge resort complexes in Nassau and in Freeport. This map shows all of the many islands that comprise The Bahamas. There isn't a lot of contouring, as the country's highest point is only 36 feet above sea level. 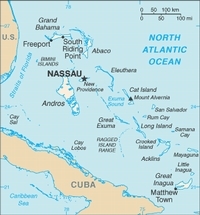 An inset map expanding the island of New Providence, and separate inset maps of Nassau and of Freeport, are included. The map is double-sided, east half-west half, printed on waterproof paper for durability.